One of the best things about summer is the abundance of fresh fruit that is available everywhere; my favorite of which are berries. Vibrant in color, sweet and delicious, berries can be used in many different recipes. I like to mix them in my morning oatmeal, add them to salads and even use them to make fresh fruit salsa or sangria. Of course adding them to desserts is always fun. This time of year I love making fruit crostata, a sweet pastry dough filled with fresh fruit. Although I thought peach was the most-liked in our house it seems this mixed berry is the real winner. In a small bowl, whisk together the egg, egg yolk, vanilla extract, and heavy cream. Add the wet ingredients to the food processor and pulse 3 or 4 times, or until the dough comes together. If necessary, add some ice water, a few drops at a time, to make the dough come together. Remove the dough from the food processor and work it out with your hands to even out any dry and wet spots. Form the dough into a ball, flatten into a disk, wrap in plastic, and chill until firm, 1 to 2 hours, before rolling it out. You can also freeze the dough, well wrapped, for up to 2 months. Preheat oven to 425°. Line a baking sheet with parchment paper. Roll dough into a circle and place on pan. Arrange berry mixture in center of dough, leaving a 3-inch border. Fold edges of dough toward center, pressing gently to seal (dough will only partially cover berry mixture). Sprinkle dough with a little sugar. I can't get enough fresh berries this summer - they've been so amazing! Baking them into a crostata like this needs to happen soon. Berries are my favorite too! And a simple crostata like this sounds wonderful! Mmmm all the wonderful berries! This looks great! That mixed berry filling is so beautiful, and I love your crust to filling ratio - I want to dive in. We're fans of all things crostata. Mixed Berry is high up on that flavor scale. 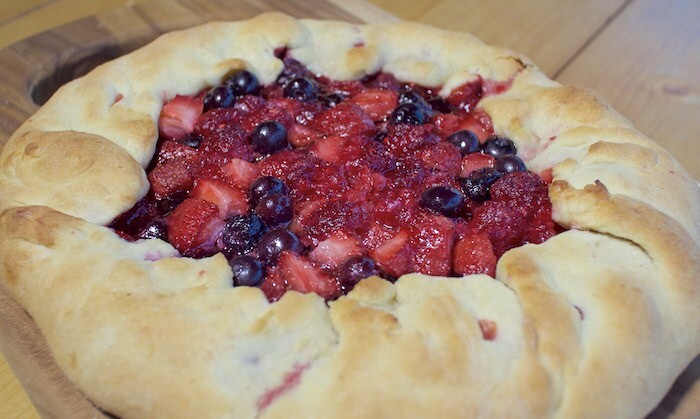 That flaky crust is a perfect accent for summer berries. This is delicious. Could I have some vanilla bean ice cream on the side please? I love a dessert like this that really highlights the fruit instead of covering it up w/ tons of chocolate etc. Beautiful. I've been wanting to make a Crostada this summer, this looks so good, pinning to try soon! I need to remember to make this recipe when I overload my basket with fresh summer fruits! This is one delicious looking dessert! This crostata looks so pretty! Love all that fresh fruit packed into this recipe...yum! Berries make this unbearable heat worthwhile. Love this crostata. It looks just perfect!! I love making crostatas. Yours looks wonderful! Your crust sounds amazing - I love a rustic dessert!